Trump loves to take credit for stock records, but his influence on the market has been questioned in recent months. His impact remains undeniable in one area, however: Companies that have the highest exposure to small- and mid-sized customers. President Donald Trump participated in one of his favourite pastimes over the weekend: taking credit for new stock market records. Whether or not he’s correct is a complicated question. We here at Business Insider have not been shy about throwing water on Trump’s claims that he’s catalyzed record stock gains, at least in recent months. We’ve also conducted an in-depth investigation into alternative explanations for a surging market. 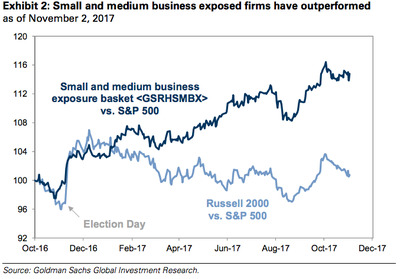 But despite our scepticism, new analysis from Goldman Sachs suggests that there is still one area of the market that’s definitely thriving as a so-called “Trump trade” — companies with high exposure to small- and medium-sized businesses. A Goldman-maintained index tracking the group has skyrocketed 38% since the election, almost double the return for the benchmark S&P 500. And they have done so largely on the prospect of less regulation for smaller companies, an outlook that pushed the NFIB Small Business Optimism Index to a 12-year high in the months after Trumps victory. 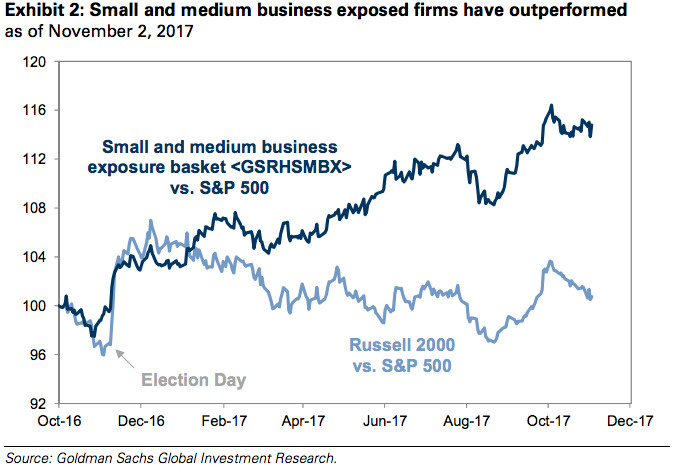 Goldman SachsAn index of small- and medium-exposed companies has almost double the S&P 500’s return since the election. “Small business owners have been thrilled at the prospect of deregulation under the Trump administration,” David Kostin, the chief US equity strategist at Goldman. Also notable in the chart above is the lighter blue line, showing the post-election performance of the more small-cap-focused Russell 2000 index and the S&P 500. After spiking versus the benchmark in the months immediately after the election, the Russell has simply matched the performance of its large-cap peers ever since. Overall, it’s clear that investors are still looking for Trump trades to ride higher as the president continues to make boisterous claims. And while the pickings may be slimmer than in the past, there are still opportunities out there, if you know where to look.